Simple. I'm working there now. My new job after the steel mill closed is working for a company that engineers solutions for oil production, transport (mainly pipelines) and refining. 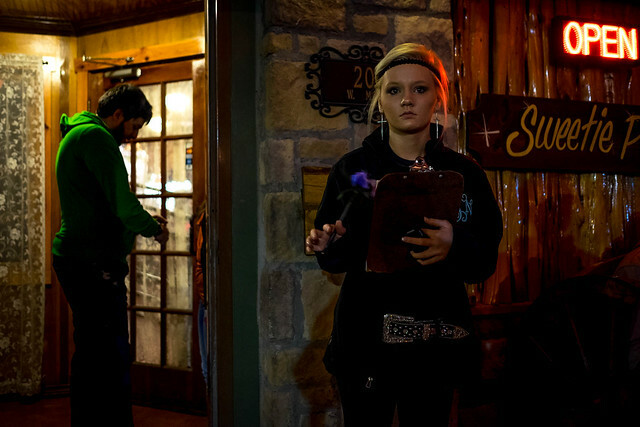 My first posting took me to the open prairies of north central Texas where I encountered the "pipeliners" who make sure a big piece of American oil production gets to refineries so it can get to YOU. But before we talk about them, I'd like to make some opening comments about petroleum and the area in general. The picture that opens the blog I call "North Texas Prairie, Late Afternoon" and shows the cattle country surrounding the pumping station where I worked adjacent to the tiny community of Ringgold, Texas. The station is owned and operated by Sunoco Pipeline Logistics. The photo above shows the station where I was working, sitting on a rise in the north central Texas prairie near a town of about 100 people. It's important to note that I didn't have much time to photograph things down there as it was a job with a compressed timeline and I worked long hours getting the new automation in place. I was the "junior" guy working alongside a very good automation engineer whose project this was. I am not permitted to photograph inside the facility for security reasons and so this post isn't about the pipeline systems. It's about my first impressions of Texas and the petroleum culture that is so strong there. For the most part, the shots I will present are my equivalent of "travel snaps". Some will not be linked from flickr as I've not posted them there. For most of them, you can click through to see a larger version if you wish. Make no mistake: there is a lot of polarized feeling around petroleum. "Big Oil" is used as almost a "four letter word" and I've had one extreme acquaintance slyly suggest I'm "FUBAR-ing" the planet. I'm also not naive enough to think that there haven't been pipeline accidents because there clearly have. But the opening quote is correct: pipelines cause far fewer problems in the movement of petroleum and gas products than any other method. Since we still need petroleum to meet our energy needs for the foreseeable future, they are absolutely necessary. Interestingly, the upgrades we make improve the safety and lessen the magnitude of a spill by providing better safety and leak detection systems and enhancements to both remote and local control of the facility. This sounds like I can do some scholarly sociological thing... although what do I really know about it? Very little. But some things are obvious all around you as you work here. 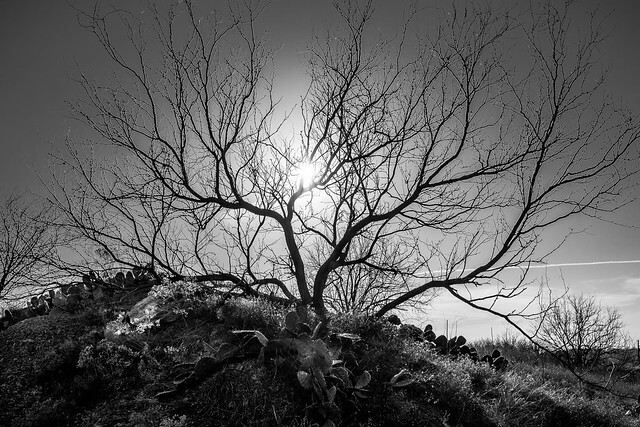 For instance, the shot above is from a rest stop on Texas Rte. 45 and the whole place is themed for oil and cattle with steel cutouts of cowboys and steer outside, and oil themes inside. 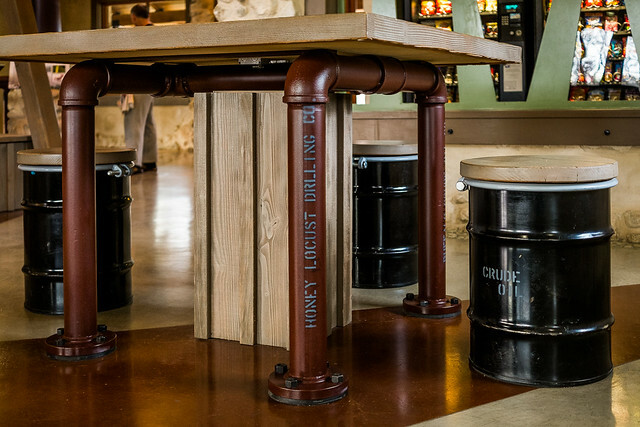 They even put in tables and chairs based on common items suggestive of oil production like pipe and barrels -- see the next photo. I was delighted at the courtesy and acceptance I found among the oil workers at the station I worked on. They taught me a lot and told me stories from their life in the oil fields, on the pipelines, and in the refineries. I'll only recount the few I think I can remember accurately enough. I have to say I totally dug the folks pride in their work. It reminded me of my own pride in being in steel production and being able to say I was a steel worker -- even if I was just an engineer, lol. When you talk about what you do for a living, is it almost an apology? Do you feel any identity with your work, no matter how humble? Or when you declare what you do does it come out like "I'm a Marine" does when Marines declare it? I can tell you that the pipeliners I met put something special in the word "pipeliner" when they say it. There are basically three different parts of oil production differentiated by "upstream" (oil drilling/production), "midstream" (pipelines and other logistics), and "downstream" (refining). Most of the guys I worked with are the pipeliners, but one in particular who is an "old timer" in the game has worked in all the phases. He works now as an inspector to validate that construction standards have been met in the pipeline construction and he was on-site when I was there to make sure the station upgrades were done properly. 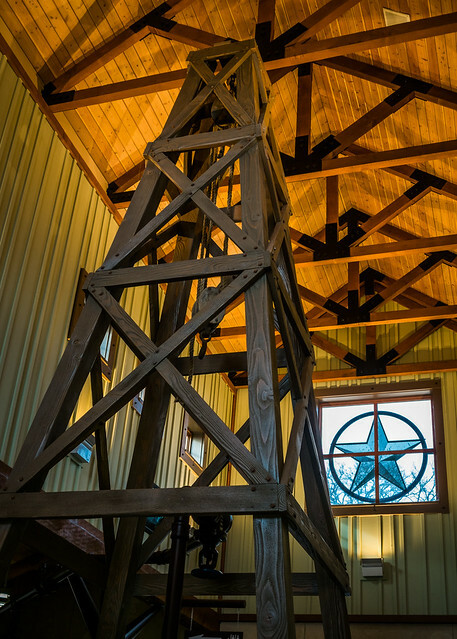 In north Texas, and other areas in Texas and Oklahoma (and in fact in oilfields all over the world), there are low volume pumping stations called "pumpjacks", "nodding donkeys", "rocking horse" or other colorful names. They come in a variety of sizes from ones that would almost fit in the back of a pickup truck to 20 foot tall monsters. They all work on the same simple principle which you can see by clicking here. Basically, they are usually used in wells only a few thousand feet deep and produce low volumes of oil from low pressure oil wells. Assuming from 1 to 8 gallons per stroke, and 4 strokes per minute, and 1440 minutes in a day, that equates to anywhere from about 100 to 800 barrels of crude oil per day. Actually, the stroke rate varies, and the pump sizes vary so things probably fall outside that range. I heard a figure of about 40 barrels a day for some wells for instance. But this gives you a feel for how much a single well produces. By the way, a standard U.S. "barrel" of oil is 42 gallons -- not 55 gallons as some might be tempted to say because of the prevalence of 55 gallon drums to transport liquids.. The oil is collected in storage tanks adjacent to the wells, and then offloaded to tanker trucks which take the oil to a LACT (local automatic custody transfer) facility that precisely meters the oil from the truck. From there, it's put into a large storage tank and ultimately delivered to a pipeline system to move "downstream" to a refinery. At Ringgold station last year, they collected and transported -- from the LACT alone -- something not far south of a million barrels for the year. I was told the exact number, but I'm not sure how proprietary it is so I'm speaking broadly to make a point: all those little wells add up. And this is just in one small area of a much larger collection region spanning multiple states. So what does "crude oil" suggest to you? Most would think of some thick, black, tarry liquid. In many cases, crude is anything but. There are both "sweet" and "sour" crudes in the area (distinguished by their hydrogen sulfide -- H2S -- content) but overall they are of the "light" variety which can be more like kerosene in viscosity. In fact, one pipeliner of long experience told me, they would get some light sweet crude that was so pure, it would separate out when left standing. The light fraction on top resembled gasoline -- so much so that it could be used as gasoline and was called "white gas". It was so similar to gasoline it could be used to run a car with little adjustment and they did just that, although it lacked the tetra-ethyl lead used as a valve protector and octane booster. As he told me, "After awhile it would ruin your valves, but free is free." The pipeliners I met who did the construction and maintenance of the long pipeline sections all were of a certain "breed". By that I mean, able to live for long periods "off the grid" -- camping in trailers in out-of-the-way places and making life work. Most of them these days carry mobile hot spots, have generators for their modern electronics or find camp sites that cater to such folks that have amenities like shower facilities, electrical and sanitary hookups, etc. I put it to the most experienced one I met that they were like modern gypsies with their wagons traveling from job to job and he laughed saying that he'd not thought of it like that. Since then I realize that a better analogy is that of a mercenary -- a "hired gun" you bring in to get the job done. But this may lead you to believe they are just a bunch of uneducated roughnecks -- nothing could be further from the truth. Although the heavy mechanical trades are well represented, pipeliners also include highly technical trades like the one above. In this case a mobile metallurgical X-ray facility to allow detailed inspection of pipe welds and walls to verify that nothing is compromised. One of the pipeliners gave me a sticker for my hard hat with their cool steer skull logo and I treasure it. Desert NDT also does ultrasonic testing -- basically tests which involves "non destructive testing" which is what NDT stands for. They are tough, skilled and hardworking and absolutely essential to the lifestyle we have all come to enjoy. Next time you drive your car, or use anything that was made or is energized by petroleum -- thank a pipeliner. Actually, I put that title forward just for dramatic value. Any study of the great state of Texas shows a rich and storied history. But it is true that between cattle ranching and the advent of oil production that Texas's fortunes expanded. As Texas grew, the funds available for infrastructure in what would ordinarily be a poor rural environment were expanded. 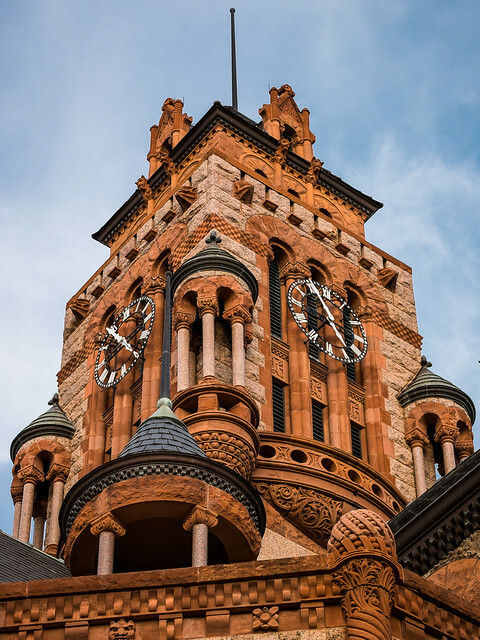 One feature of many of the north central Texas towns I went through is elaborate courthouses. 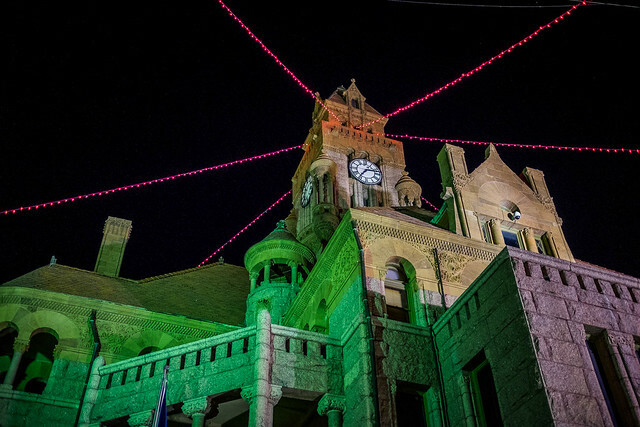 But there is one of note that has a legend attached to it: the Waxahacie courthouse. The story I was told was a bit different than ones I've read online. I heard it was an imported French architect who was brought in to design and supervise the construction. 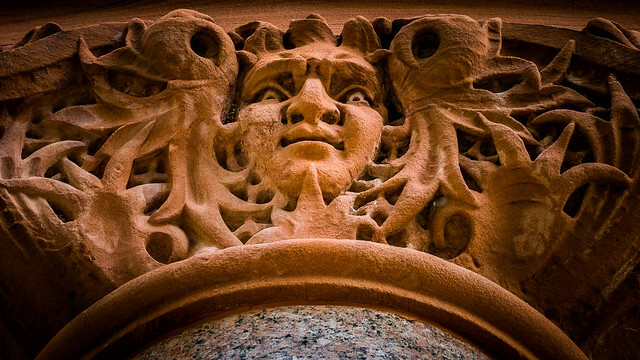 While there he engaged in an unrequited love affair with a local woman and carved her likeness (or had it carved) into the stone faces that appear around the lower cornices. As his disillusionment with the failed relationship continued, he allegedly carved increasingly distorted images into the cornices -- some positively demonic or at least angrily raging. 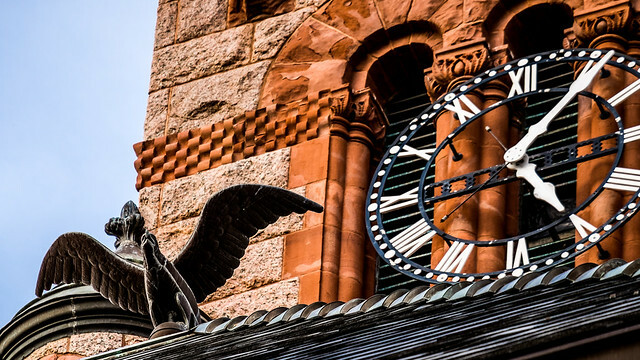 There's no doubt though that the courthouse architecture is stunning. There is a great deal of dispute though on the story and the all of the details surrounding it. A good place to see a summary of that is at Roadside America: Unrequited Love Carvings. So, the story is good -- true or not -- but it's indisputable that Waxahacie has an architectural gem and if you find yourself out there you should check it out. Next here's a shot from Decatur, Texas which is north of Waxahacie. Although it also has a nice courthouse, it's not in the same league as Waxahacie's. Decatur has another attraction that I highly recommend: Sweetie Pie's Ribeye's. The building is historic and it was once two stories tall before a fire destroyed it and it was reduced to a single story. It has housed several restaurants but I can't imagine anything better than Sweetie Pies. Best steak I had in Texas and that is saying something. 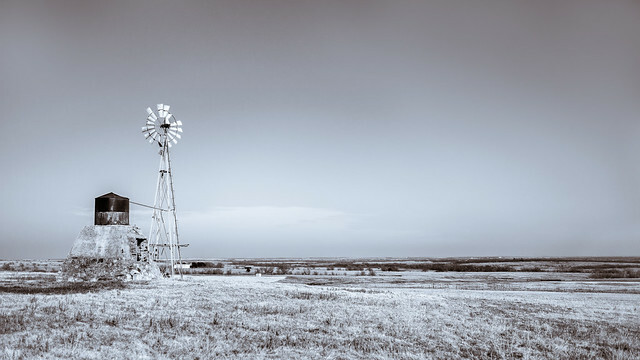 The very first shot I put up in the blog is a shot from the almost desert-like prairie of north central Texas. It has sparse grasslands, mesquite, and cactus in abundance. It's manifests as a gently rolling land that seems to stretch to infinity. Dotting it sparsely are the small oil wells that the landowners lease to energy companies. Rural areas almost always present as less affluent. However, although that may be true the people living there often don't view it that way. A lifestyle that confers freedom and liberty for your hard work and independence is attractive to some people. But the uncertainties of a lifestyle closer to a subsistence living does mean that sometimes failures happen as the local economy changes due to societal, technical, or even meteorological changes. The photo above tells a bit of the story. 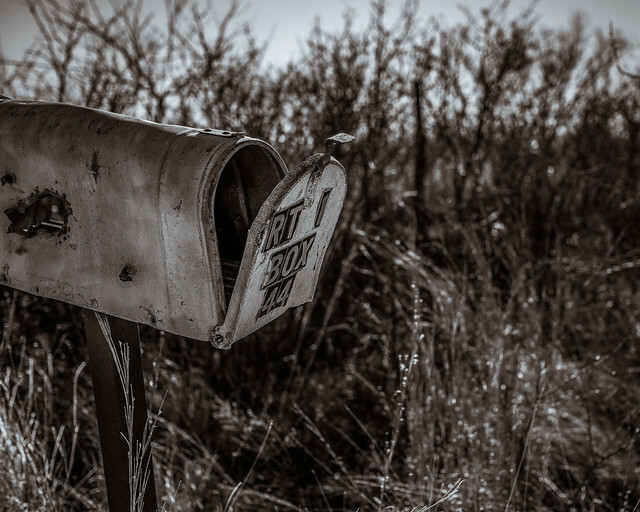 On the dirt roads which criss-cross the prairie is this mailbox that stands where only the wreckage of whatever house was there remains. You might think that this is a cherry picked example to make the roads look undeveloped -- but you'd be wrong. In fact, except for the "highways" that pass through (usually paved two lane roads that have a 75 mph speed limit) all the roads are dirt -- even the ones in the center of the small town of Ringgold. Almost everything is a dirt road through the prairie. If you ever wonder why rural Texans in particular favor trucks and 4 wheel drive this is why. I almost got the rented Chevy Impala stuck in some places. I think I'll rent an SUV next time! Scenes like the above are everywhere. 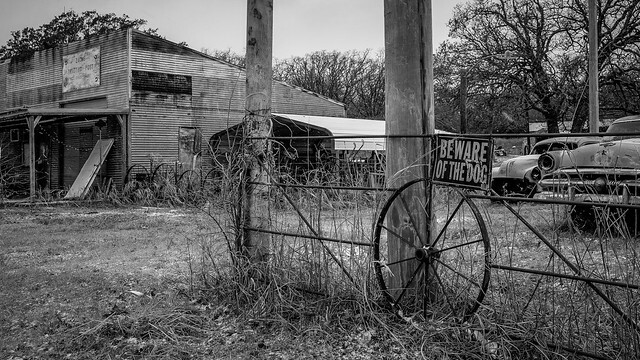 For every active farmstead/ranch you see you may also find one that has been abandoned. 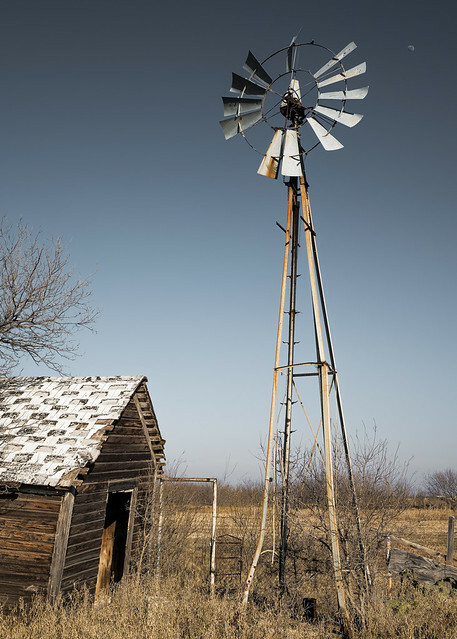 The windmills are ubiquitous as water pumps in a land that occasionally lacks necessary rainfall. But the larger towns are not immune to entropy. The far from "ghost town" city of Nocona is known for making some of the most famous and coveted baseball gloves used in professional baseball. Still, the town shows signs of shrinkage as seen in this shot of an old store on the edge of town. There are big cities around and not too far away. About 2 hours away from Ringgold is Dallas and within an hour is Wichita Falls. But closer in is what passes for large: the town of Bowie. This is pronounced "Boo'-wee" and doesn't have the long "O" sound but a sound like in the word "hoot". It's interesting because we have some hero's of Texas who have towns named after them. Sam Houston? Huge mega-city. Stephen Austin? Large town for sure. Jim Bowie? The little 5000 person town of Bowie. 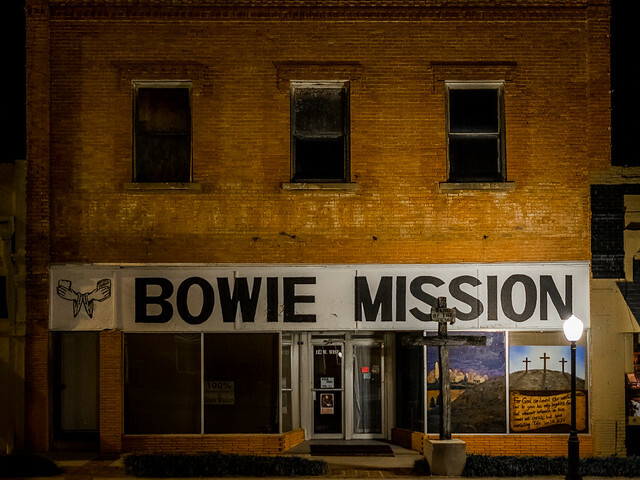 Here's the Bowie mission filmed at night. So, to many of you this may look like a remote or forsaken area but it is anything but. The people have a spirit, and the land a feel, that I really admire and like. I'm looking forward to going back.